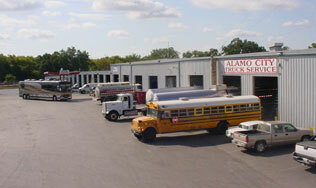 Alamo City Truck Service offers service, repair, inspections and free estimates for any service on all makes and models of any truck, trailer or coach made. With 25 bays at our facility, we have enough room to assist you in a timely manner. We offer a complete line of WIX components. We also offer parts for Cummins, Caterpillar, Eaton, Fuller, Rockwell, Spicer, Freightliner, Volvo, White, Mercedes-Benz and many others. Complete truck and trailer all under one roof!